Do you believe working with still images in a blog limits you in certain ways? Well in fact it does. It is very hard to build a image gallery that looks alive no matter how colorful the images are. First pick an Carousel type for your content. You have four options to pick from- Cover-Flow, Carousel, Flat and Wheel. You can pick the image you want your visitors to see first. Simply toggle off the Item Starts From Centre Option and then type in the serial number of the image you want to display first. You can toggle on the Loop option. If you choose to pick Autoplay for the slides toggle on the Autoplay option. Immediately you will see a new field- Autoplay Timeout (ms). Type in your desired interval between two slides. You can allow your visitors to use their mouse scroll button to navigate the carousel. You can separately edit the slides on your carousel from the Flip Carousel Slides option. Click on any of them to open its customization options. From there include an Image and Text for your slides. From the Flip Carousel Style you can adjust the background color, padding, margin, border type and border radius. You can use an Custom Navigation style for the Carousel. Once you toggle on the Custom Navigation option, you will see new options. You can pick a Previous and Next icon from a drop down menu containing hundreds of readily available icons. 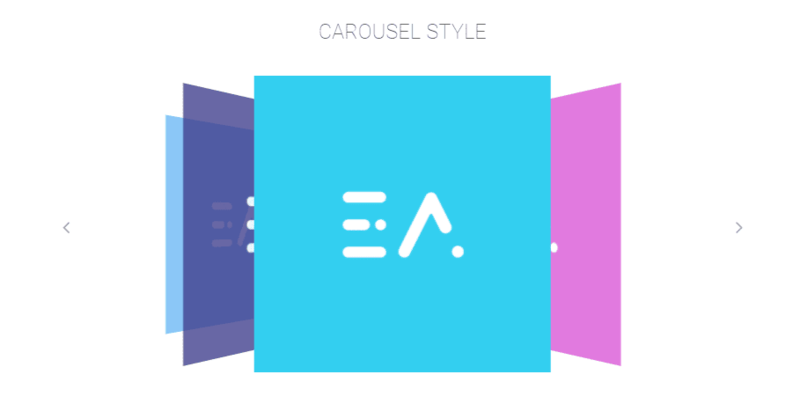 See how beautiful Flip Carousel you can build with Essential Addons.